2014 Yorkshire & Lincolnshire Get Inspired Unsung Hero announced! 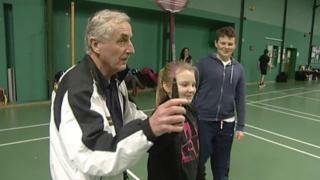 Roger Tanner is a former school teacher who for the past 50 years has been the fulcrum of the East Riding Badminton club based in Hull. In that time he has coached thousands of badminton players in the city and East Yorkshire, and was was at the heart of funding raising activity and gaining the grants needed to carry out work to refurbish the club's 50 year old hall. One of the aspects of Roger Tanner's involvement with badminton that most inspired the judges was that despite all his coaching, all of his tournament organising and all of his fund raising activity, he still found time to actively play the sport he loves.